As the Kaurava and Pandava armies stood face-to-face, ready for the attack, there was sudden uproar in the Pandava army. Everybody was surprised to see that Yudhisthira had placed all his weapons on the ground and was moving towards the Kauravas. Arjuna and Krishna ran behind him fearing that Yudhisthira might call of the war. Yudhisthira went through the Kaurava army to the place where Bhisma was standing on his chariot. He touched Bhishma's feet and said, "We are being forced to fight against you because of the stubbornness of Duryodhana. I request your permission to fight and your blessings." Bhisma was overjoied. He permitted Yudhisthira to fight and blessed him. 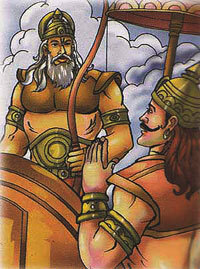 Then Yudhisthira went to Dronacharya, Kripacharya, and his maternal uncle Shalya for their blessings. All of them blessed Yudhisthira.